Weave a handmade baby wrap that will stand out from the crowd! Different threadling produces different patterns. The random yarn order of the warp makes for a lively fabric even when woven with just one colour. Also, because of that the patterns appear in a very subtle way. 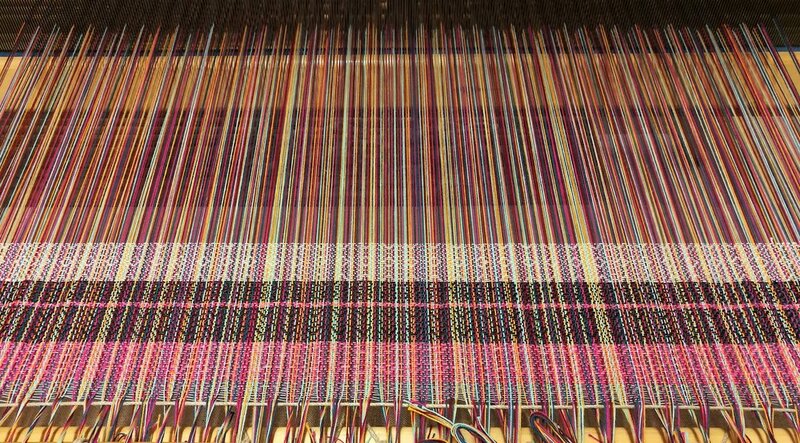 The weft colour will also affect the texture: if there is a sharp contrast with the warp and weft colours, the patterns will come out more clearly. Finished fabric woven with the warp colours. The finished baby wrap can feature fringes, or you can hem the edges of the fabric. The sewing machines at Kutomo can be used for the finishing. In addition to a baby wrap, this fabric could be used as a light sharf or a lined tote bag.